While experts agree that current research will not result in an Ebola "cure" for this outbreak, scientists and startups around the globe are racing to find a marketable treatment. Here's a rundown of where the most advanced efforts stand. The San Diego-based company Mapp Biopharmaceuticals is ramping up production on its now well-known Ebola drug ZMAPP. The drug has been given to at least two Ebola patients who survived. Mapp reportedly has a major pharmaceutical partner but the company has not named them yet. The federal agency Health and Human Services gave the firm $43 million in early September to accelerate the development of the drug. Mapp has sub-contracted with Kentucky BioProcessing, a subsidiary of R. J. Reynolds Tobacco Company, to inject tobacco plants with the three antibodies in their 32,000 square foot site. Kentucky Bioprocessing tells CBS News they have put "all other projects and activities on hold to devote all of their efforts to Zmapp". The Canadian company Tekmira has been developing the drug TKM which was given to a patient in Nebraska who then survived. The firm has received funding from the Pentagon's Defense Threat Reduction Agency. In May 2014, Tekmira successfully completed the a Phase I clinical trial in human volunteers according to the company. The Japanese firm Fujifilm Holdings has been working with its subsidiary Toyama Chemical to develop the treatment Avigan which was given to European patients including a French nurse who then survived according to the company. Fujifilm tells CBS News the French and Guinean governments have a plan to start clinical trials in a few weeks. The company has more than 20,000 courses in stock and has already established a manufacturing pipeline. Avigan is an influenza drug and the Japanese government has already approved Avigan for influenza this past March. In the U.S. the drug has been going through Phase 3 trials as an influenza drug and the Pentagon has supported this effort with $138 million. The third largest pharmaceutical firm in China Sihuan Pharmaceuticals says they are also working on an Ebola drug called JK-05. There are no reports of the drug being given to any patients in the US. Chinese officials have approved the drug for use in emergency situations and the company has reportedly sent the drug to Africa with aid workers. 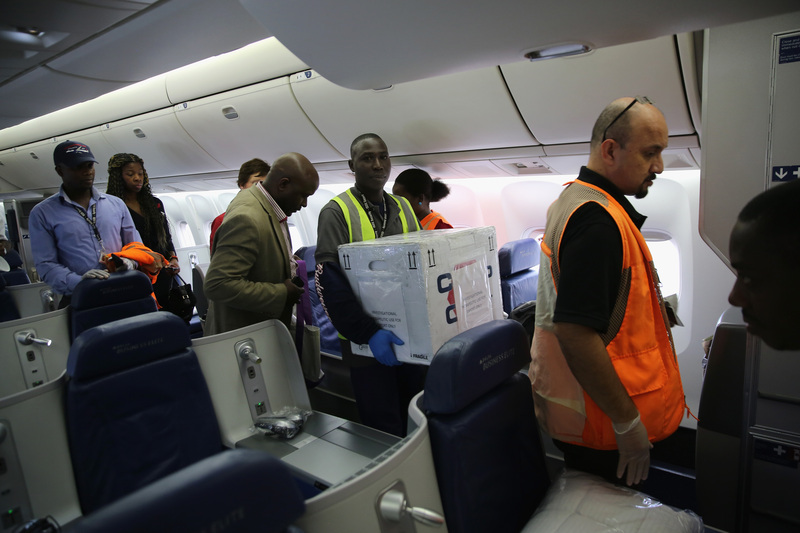 Two North Carolina-based firms are working to develop Ebola treatments. BioCryst is working to develop their antiviral drug BCX4430 that is expected to begin Phase 1 testing later this year with the support of the National Institutes of Health. Chimerix, also in North Carolina, developed one of the drugs that was given to the Liberian patient Thomas Eric Duncan. The tablet is called brincidofovir and last week the company announced it now has FDA approval to expand testing. The company says it is assessing the best way to provide brincidofovir to patients in Africa. One of the more experimental approaches is the possible use of a natural anti-oxidant and anti-inflammatory treatment called Kolaviron made from bitter kola seeds. Bitter kola is a native African tree that grows in rain forests. The seeds have been used for a variety of ailments. Now a Nigerian professor at the Bio-resources Institute of Nigeria is in the process of working out an arrangement with NIH contractors who can evaluate the effectiveness of the extract on a patient with Ebola according to the NIH. One treatment that hasn't received much attention is the drug AVI-7537 developed by the Cambridge, Massachusetts-based firm Sarepta Therapeutics. While the drug has not been given to any patients in the US, early studies with primates were promising. In a clinical study 60 to 80 percent of primates with Ebola who were given the drug recovered compared to 0 percent of the primates who did not receive the drug. The company tells CBS News it has 20 doses in stock. The Pentagon invested in AVI-7537 with a $291 million contract back in 2010 but pulled funding in 2012 due to "funding constraints". Today, instead of focusing on Ebola, the firm is busy working on advancing its muscular dystrophy drug.